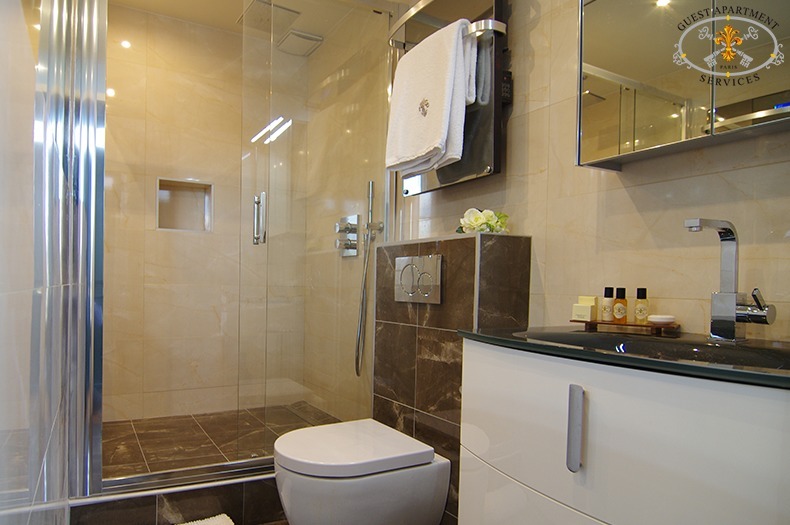 Functionnal bathroom adjoined to the bedroom offers a shower cabin, washbasin, toiletries, lit mirror & WC. 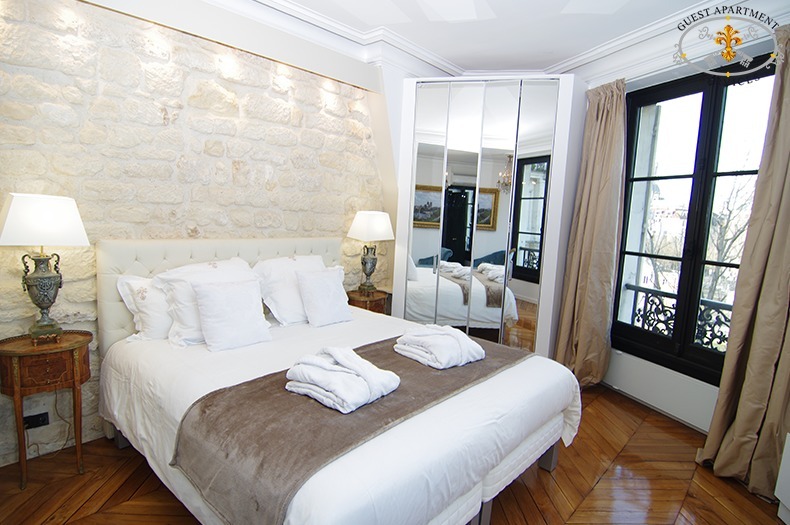 AMBIENCE: Located on Ile Saint-Louis, and a 17th Century edifice, is an exceptional apartment, which will exceed your expectations. It combines a perfect location in an historic neighborhood, with all of the modern conveniences of home whilst still retaining its old world charm. Upon entering the building through an impressive wrought iron gate door (a unique feature on Isle Saint-Louis) you cross a paved courtyard before ascending a spiral stone stair case with decorative wrought iron railings (classified by National Patrimony) before reaching the apartment ‘Windows on the Seine’ located on the third floor. 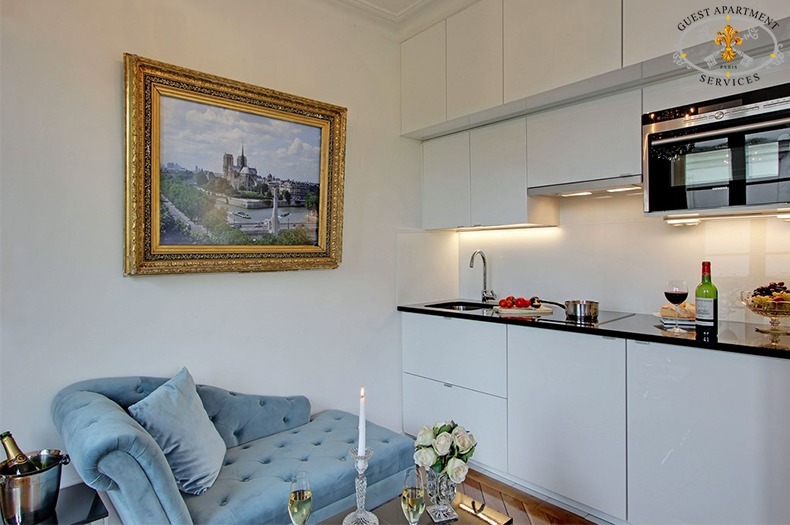 This apartment really has the wow factor! 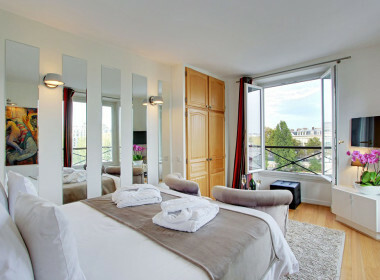 Stepping inside you will gasp at the almost 180 degree views of Paris and the Seine River below. 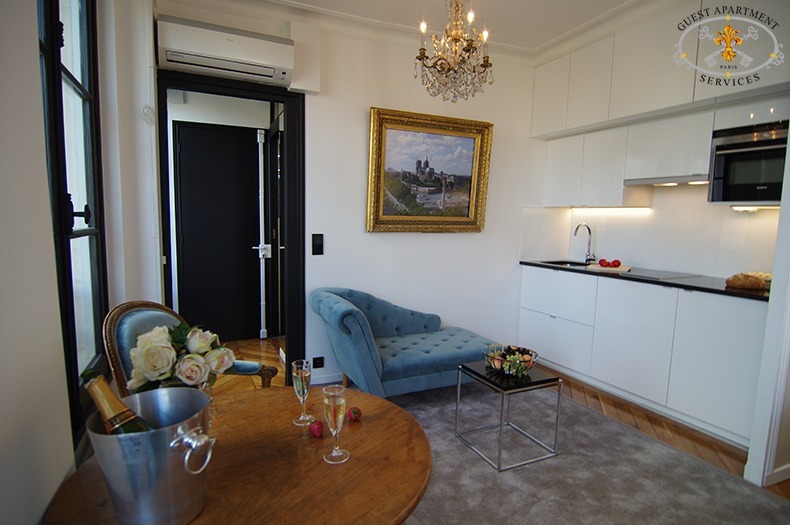 The apartment itself offers the perfect combination of refined elegance and contemporary flair. 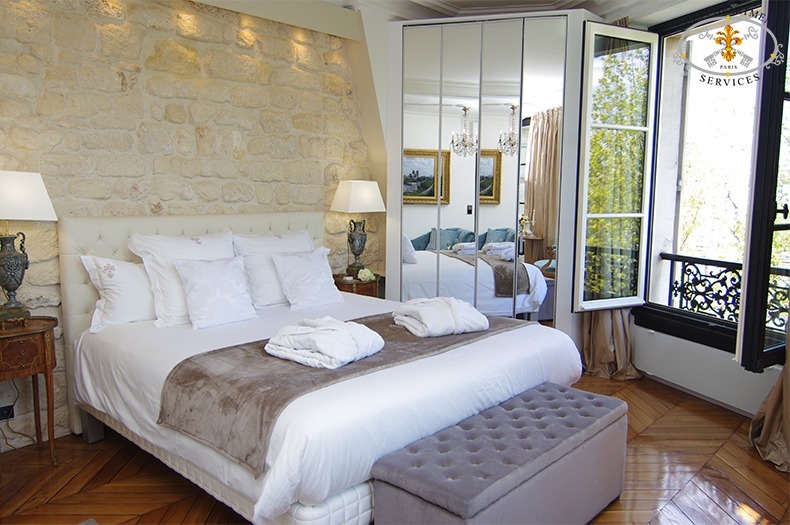 High ceilings, and four high French windows reveal breathtaking views of the Right Bank, adjacent quays, and the Seine River which flows just metres away from the building. 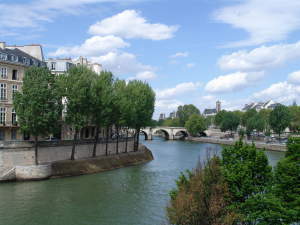 At night, the poplar trees which line the quay will reveal the twinkling lights of the Bateaux-Mouches below providing an incredible vista from your front row seats. 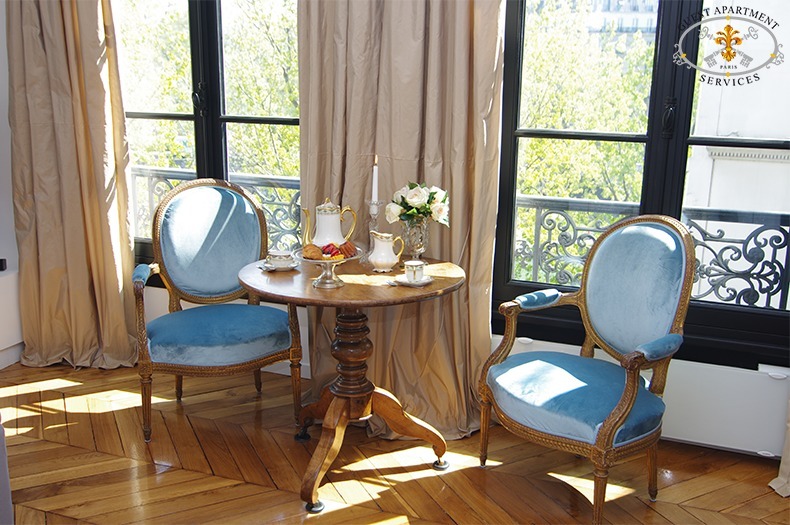 A more romantic spot would be hard to find as you sip champagne and live the dream of being in Paris! 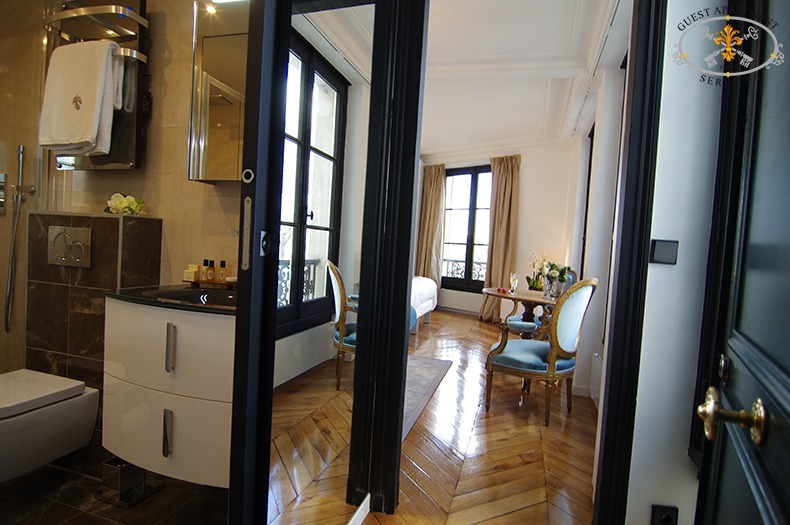 With a surface area of approximately 30 square metres (about 330 square feet) this exceptional apartment has recently undergone a total renovation by its owner for you to enjoy. 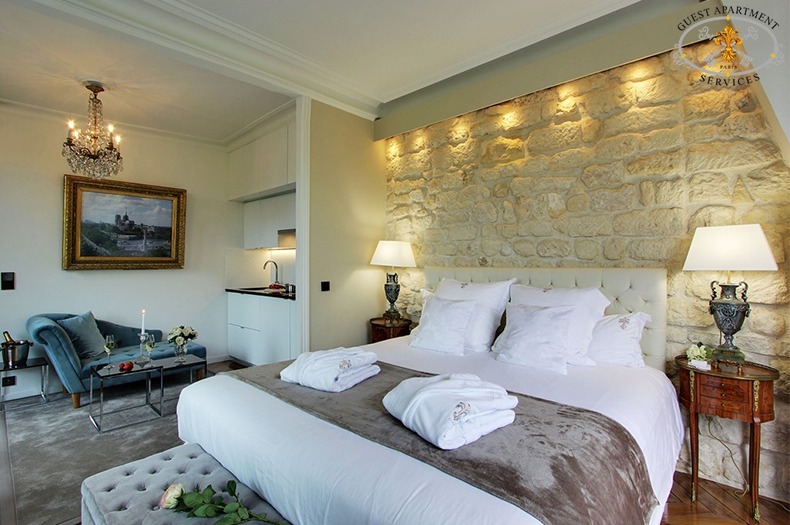 Historical features include the exposed beams, and the apartment has been renovated using only the highest quality materials and contemporary finishes to ensure your maximum comfort. This apartment’s tranquil ambience is further enhanced by the soft hues of light beige with blue tones, and a stone feature wall dating back to the 17th Century. Renovated moldings, and the floor returned to its 18th Century chevron parquetry (but with total soundproofing) completes the picture. 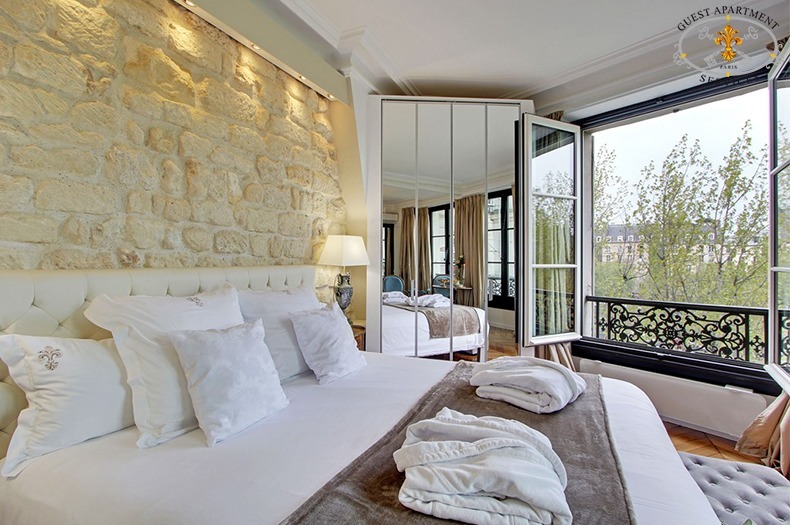 Luxurious beige drapes frame the views you will enjoy of the Seine River below. 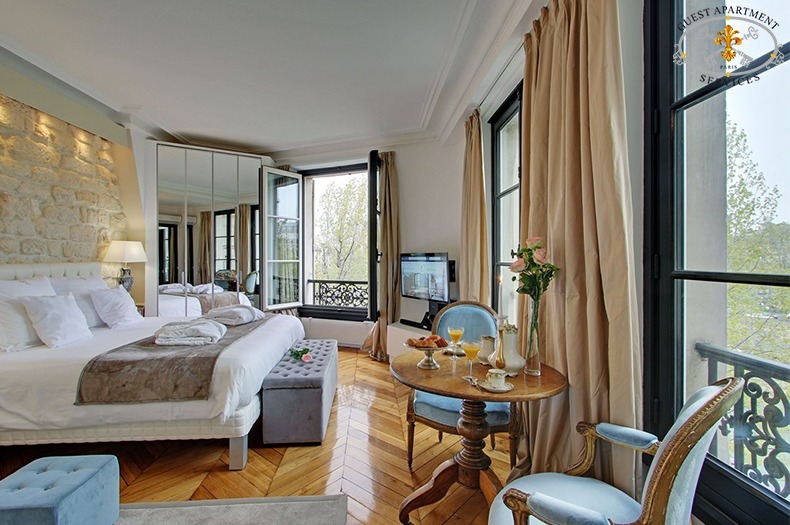 The double paned glass windows ensures the utmost calm and serenity during your stay. 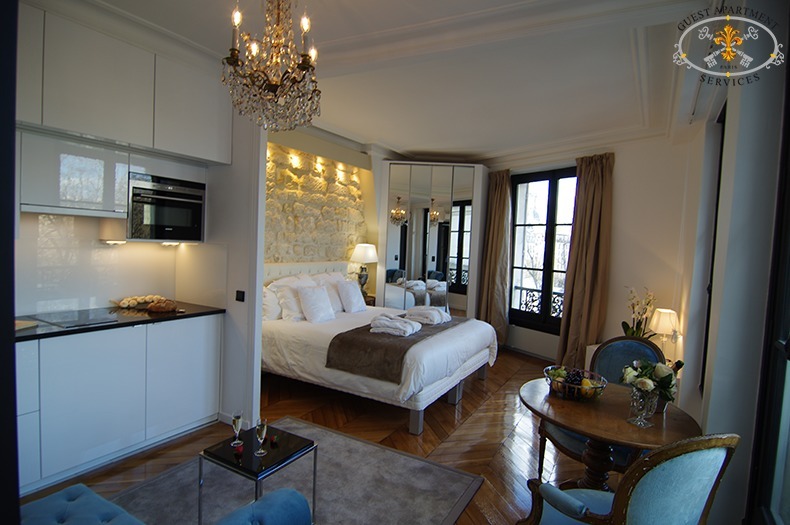 In summary this spectacular apartment provides a unique combination of historic grandeur, supreme comfort and contemporary flair. 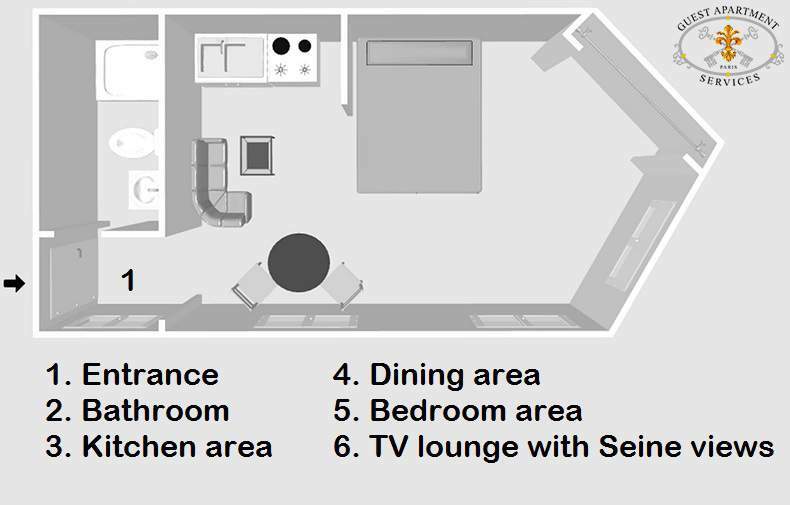 The built-in fully equipped kitchen includes; a separate fridge and freezer, a washing machine/dryer unit, convection hot plates, microwave oven, toaster, and a coffeemaker. 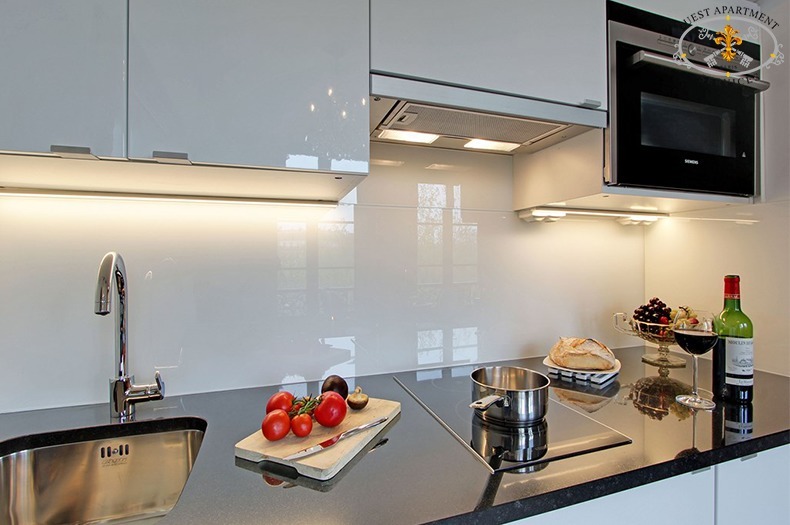 It offers the perfect ‘no fuss’ kitchen for preparing snacks and light meals during your stay. Imagine yourself enjoying convivial conversations over a bottle of champagne or good wine while preparing a romantic dinner for two seated on a cozy plush velvet ‘meridienne’. The dining area is further enhanced with two antique blue velvet armchairs and a pedestal cocktail table beneath an authentic crystal chandelier. 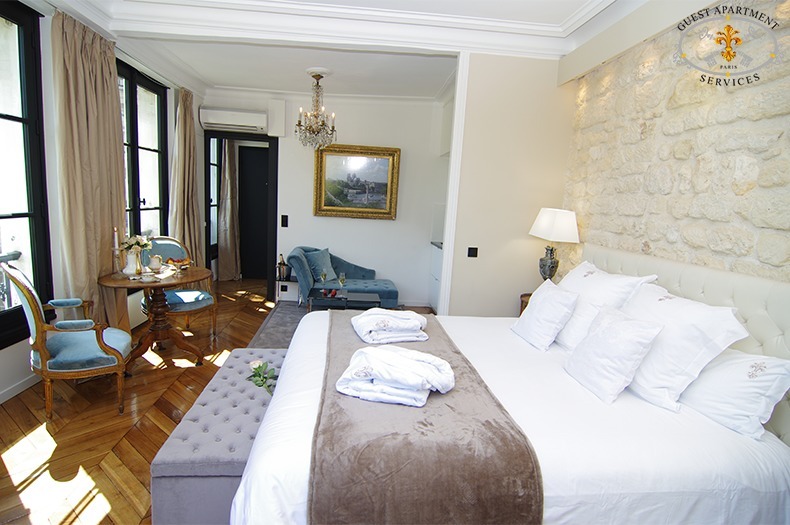 The bedroom area features a new king size bed, which can also be easily converted into twin beds. 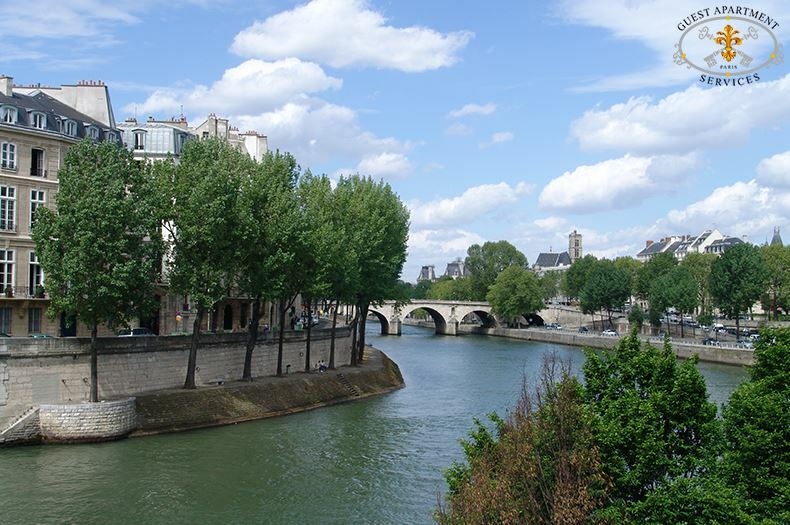 The views of the River Seine will take your breath away! The bed is further adorned with two antique bedside tables with 19th Century reading lamps. The large bespoke wardrobe is covered in mirrors, and nestles in the corner whilst reflecting the space and light that floods this glorious apartment. The recently laid luxurious marble floor in the bathroom is textured with cream and brown tones, and also boasts a large wall mirror. 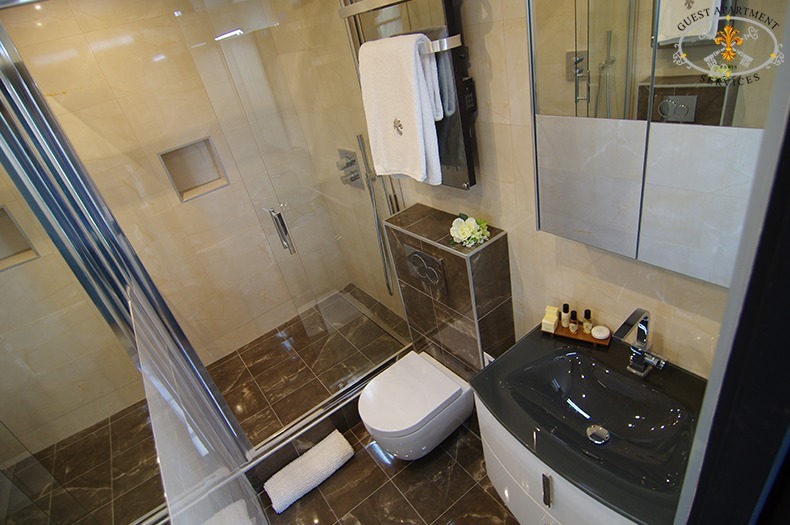 An Italian walk-in shower, vanity basin and W.C complete this elegant bathroom suite. Additional appliances included in this property are: A Colour TV with cable channels (CNN, BBC & other international networks), a DVD player, Stereo/Hi Fi sound system with CD player, a private telephones (one located in the kitchen, and one in the bedroom), and an answering machine for your added convenience. PLEASE NOTE: This building is also home to a custodian who has lived there for over twenty years. Only residents of the building know the door code to access the building.